And we had another bluebird day. The skiing was a treat on all aspects, Zuma, Beavers, Front Side, North Side. It was not a warm slushy day. 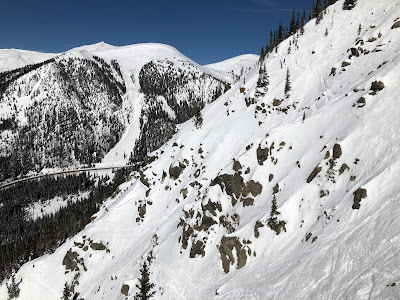 It was a cool late winter/early spring kind of winter snow, kind of great skiing, kind of awesome day. Looking across the 4th Steep Gully with the Widowmaker in the background.